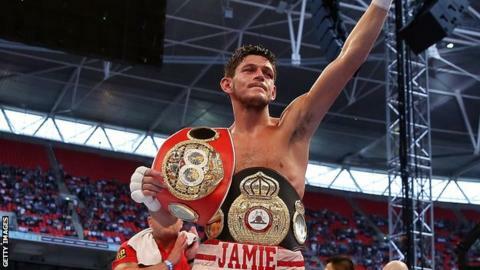 Doncaster's Jamie McDonnell hopes a win over Japan's Tomoki Kameda in Texas on Sunday will lead to an all-British world title fight against Scott Quigg. McDonnell, 29, is defending his WBA world bantamweight title against Kameda, whom he narrowly outpointed in May, for a second time. Bury's Quigg is the WBA super-bantamweight champion. "The plan is to beat Kameda again and then move up. The Quigg fight would be a massive night," said McDonnell. "I've already proved that I belong at the elite level, super-bantamweight is only four pounds heavier and I am a big bantamweight. "I've been working on my power and I feel it's going to pay off. I'm always in great shape and I've been flying in the gym." McDonnell, who has 26 wins, two defeats and one draw as a professional, had to climb off the canvas in the third round of his first encounter against Kameda before being awarded the decision by a single point on all three judges' scorecards. It was the first defeat of Kameda's career, the 24-year-old having won his first 31 fights, many of them in his adoptive country of Mexico. Quigg last defended his title against Kiko Martinez in July. A unification match against Belfast's IBF champion Carl Frampton has been mooted but they have been unable to come to an agreement so far.